Batscan is an advanced monitoring system for back-up power batteries. Batteries are being used in many different areas as an alternate power source in the event of an power outage in the public power grid. In air traffic support systems a power failure could be fatal and many companies and organizations are depending on reliable power supply where a sudden loss of power can cause large problems and high costs. All batteries are aging and needs to be replaced after some time, but they can also fail from a variety of reasons during their normal life span. It is therefore necessary to monitor the batteries so that a faulty cell can be detected and repaired before it jeopardizes the reliability of the whole battery. A Battery compares to a chain: The battery must be able to supply the load with enough current (Amp) and the chain must carry the weight of the load (kg). An open cell in the battery is like a rusty link in the chain that eventually breaks, it doesn't matter that all the rest of the links are fine, the chain will be useless anyway because of one broken link. Each cell in a lead/acid battery increases the voltage by 2V (Volt). The figure below shows a battery with 4 cells that gives 8V to the load. An open cell will cause the voltage at the load to drop to 0V and all the battery voltage will instead appear over the faulty cell, -6V in this simple example. In reality, a typical battery consists of 200 cells connected in series giving a total battery voltage of 400V. Such high voltage over a single cell would cause overheating and emission of explosive gases. With high risk of explosion! Although all the other 198 cells (99%) are OK, the battery cannot give any voltage with one open cell. 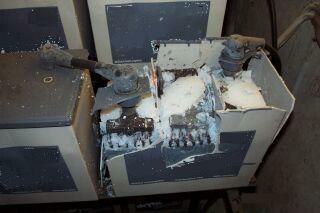 Often several cells in a battery need to be replaced every year. With Batscan a faulty cell will be detected in an early stage, preventing the battery from being the cause of power failure. the whole battery will collapse.